I have always enjoyed hand made soap. I started making soap for my family over 17 years ago, and am now very proud to be offering my all natural hand made soaps for your enjoyment! I make all of my soaps, lotions, shampoos, (all of my products) from scratch, using all natural ingredients. I use a cold process soap making method, and absolutely do not use any melt and pour methods some people associate with soapmaking. I believe that soapmaking is exactly that… making soap from non-soap. You are welcome to review the process to answer any questions about how I make my soap. Whatever your reason for using all natural health and beauty products, Augusta’s Way is sure to meet and exceed your expectations. I use all natural ingredients to ensure the best overall product. I use tried and true combinations of vitamins, essential oils, raw herbs, beeswax, soybean, coconut, olive, jojoba and grapeseed oils that, in combination are just amazingly PERFECT for personal care! To order Soaps, Lotions or Shampoo please visit my Online Store. To find out more about me, my business, the soap making process or if you are just curious as to who Augusta is, please browse around for a bit. I have listed retailers and up coming festivals for your convenience. I hope I am able to answer any questions you may have within these pages, but if you can not find what it is that you came here for, please email me and I will get back to you as soon as I can. If you have a business or web site that is geared toward sustainable living, send me a link and I will add you to our resources page. Be sure and read the testimony of people who have used my product, or if you have feedback please email me. I do my best to provide prompt, accurate service. You can now follow me on Facebook! Keep up with available products, upcoming festivals, etc… See you there! 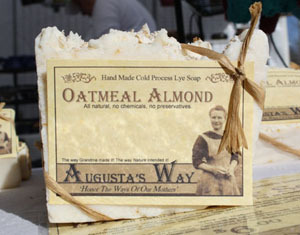 Augusta’s Way products are all natural, not just some or a little bit! I believe that what we put ON our body goes IN our body, therefore the more chemicals and harsh ingredients we can eliminate, the better! So, while this limits the variety of scents I offer, it increases the natural quality of my products, which ultimately is my reason for making them! All of my products are created in small, controlled batches to ensure quality! I use only all natural ingredients, including 100% All Natural Therapeutic Grade Essential Oils!